replaced with the most amazing water bird life! coming to visit at the bottom of your garden? even in a small room utilizing every bit of available space. 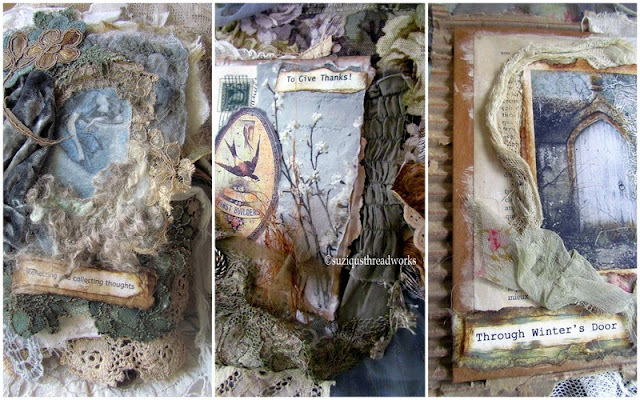 textiles, paper, card, images, found objects etc. 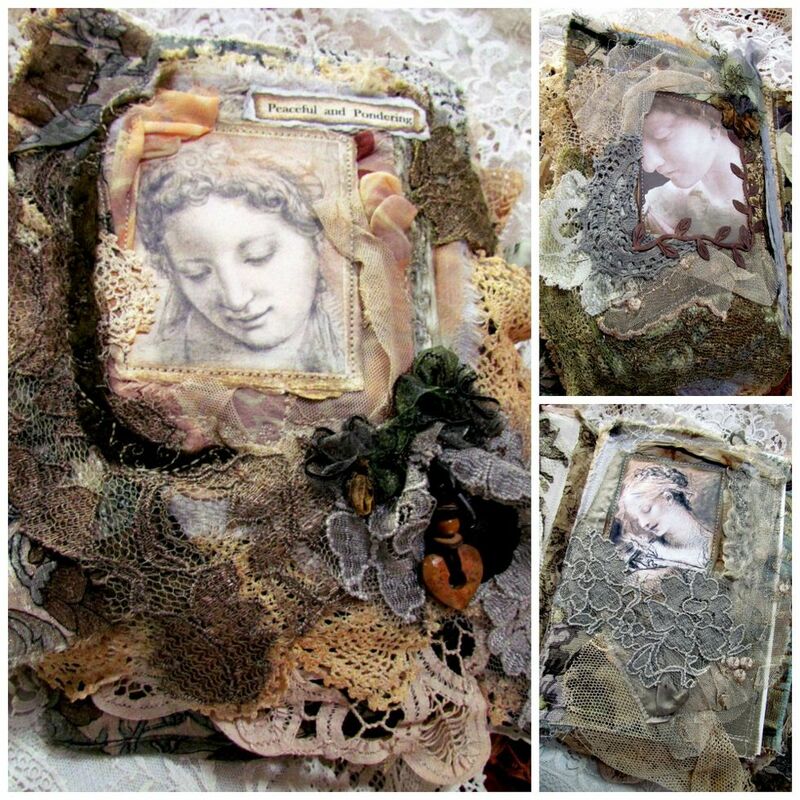 and journal pages as well as some other collages and artworks which I have created. 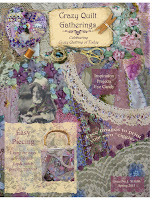 also participating in this party so you can see her creative space on her blog). as you enter the door. in just a matter of a few weeks!!!! Every day I'm still looking for things I can't find! surrounded by these items close at hand. 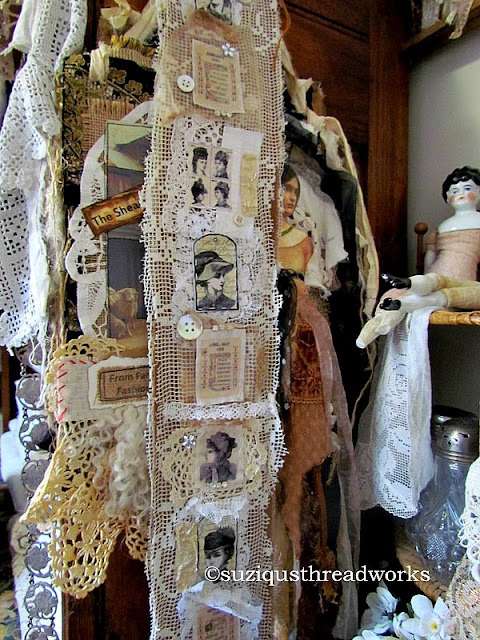 findings and the shelves above carry the stamps, paints, cards, images, laces, embellishments, postcards and ephemera. only if they are tattered or torn etc. 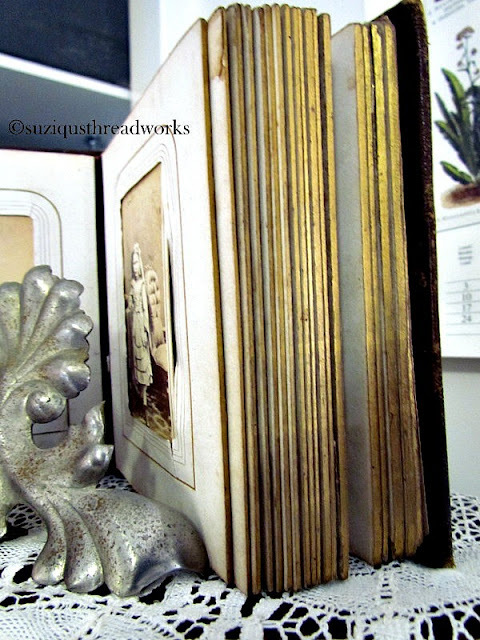 with a few of my journals in the corner. 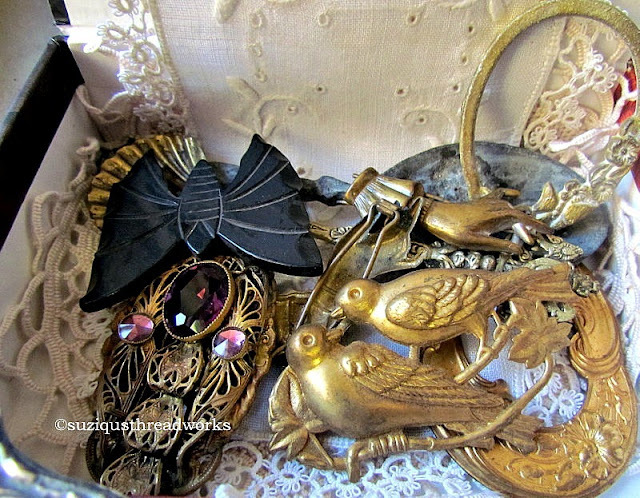 some old frames and vintage hats. a gifted snippet roll over one of my collages. with a selection of vintage black laces over the top. well that is just around the corner in a huge linen cupboard! Hoping you will drop by again soon! 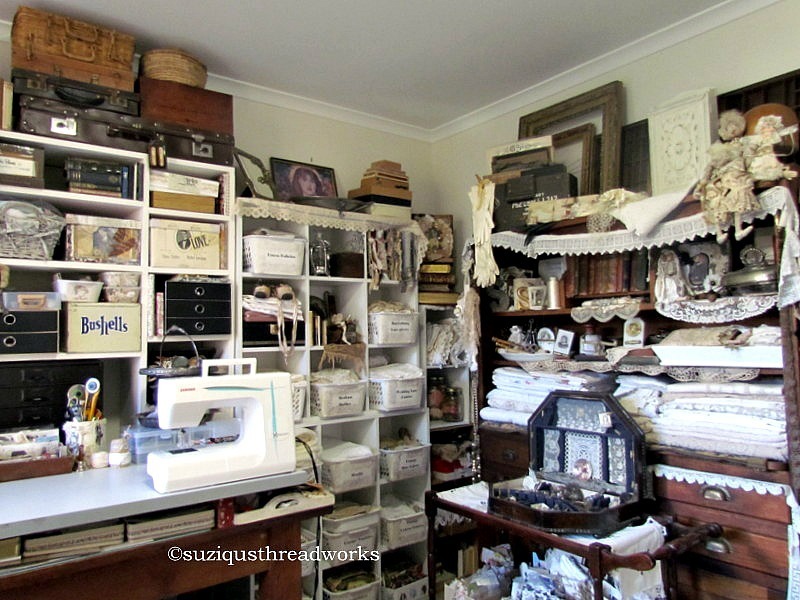 Oh my goodness Suzi, what a totally incredible space!!! 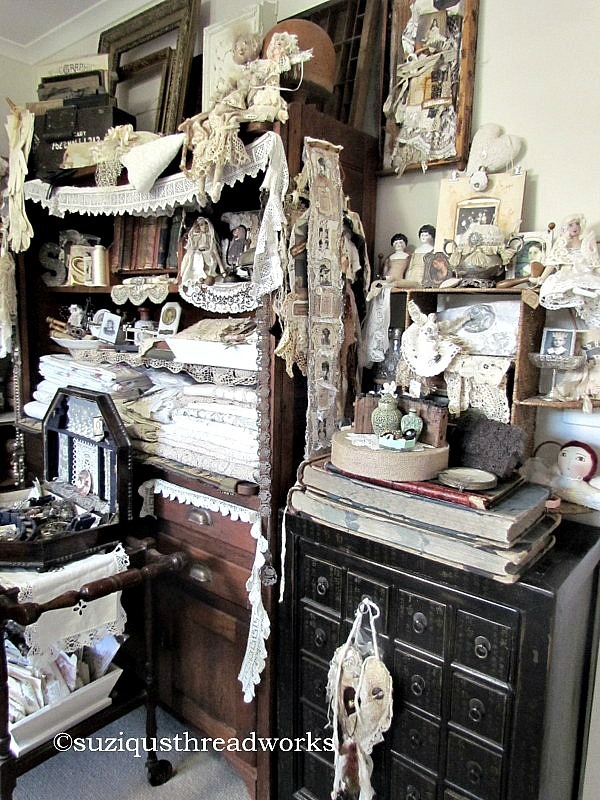 It must have taken a truck to move all those treasures to your new space and I am just in awe how you have managed to get it all so organised already. Totally incredible and thank you so much for not only sharing your space, but so many of your amazing creations too! Your space is fabulous, with so many beautiful things to look at and wonderful views out of the window! It's amazing that you got yourself organised and settiled in such a small space of time. Though I do find that having a deadline focuses the mind, I know it did in my case! Your journals look like works of art and they look so at home in your workspace. This is my first visit to your blog so I've not seen your work before. Wow, your new space looks lovely and inviting. 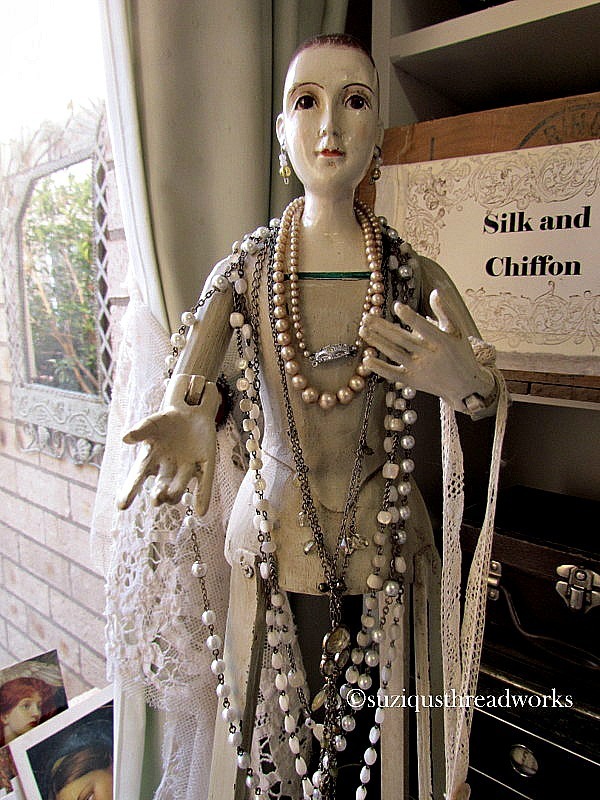 A wonderful place to create the beautiful pieces that you make. Thank you so much Dawn! Some how your comment was rejected by Blogger but I was able to add it anonymously! Very strange! Suzy, how wonderful! 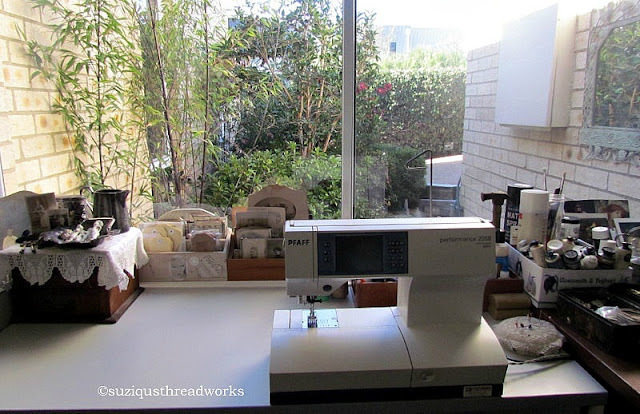 Your new creative space looks even bigger than your old one - and you have managed to put it all together so beautifully again in your new place. 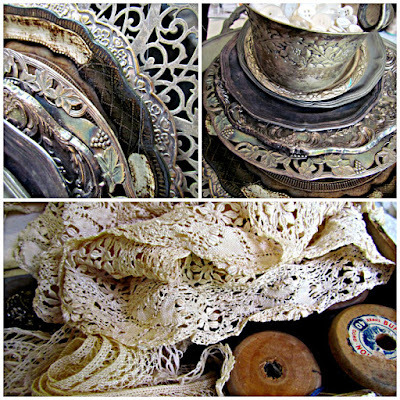 So much precious lace and gorgeous vintage textures to inspire, and it is lovely that you are creating again too. Ohhhhhhhhhhhhh, so there is hope for me, too. Every piece of crafting supplies is currently in a box ready to be moved next week. 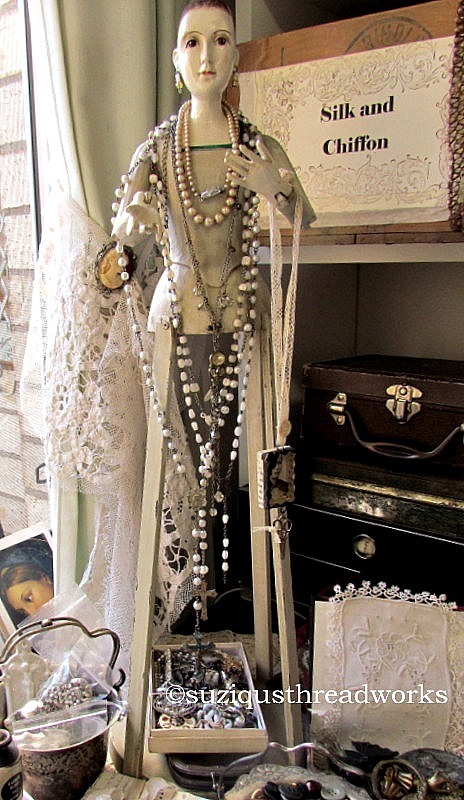 I'll go from stuff scattered all over the house into ONE ROOM. MY ROOM. I'm quite certain it won't look anything like your beautiful space - because it certainly is beautiful. Suzy. You've done a magnificent job in "setting up shop" in such a short time. 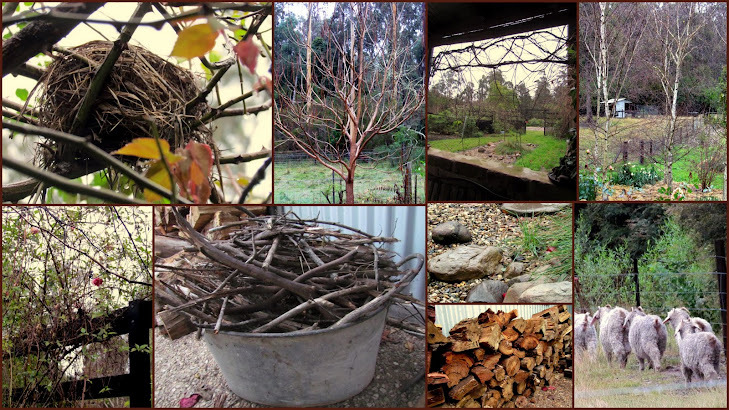 Isn't it wonderful to be able to dig right in and start working again? (Well, after you find what you're needing, that is!) Next year, look for SuZeQ's Playground!!!! P.S. 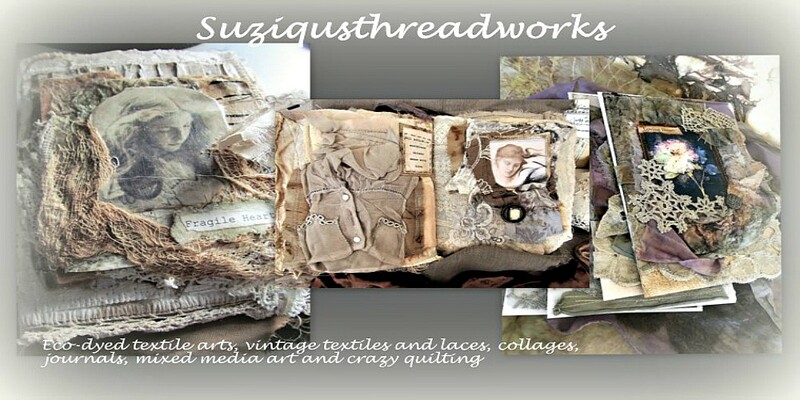 Suzy, Thanks for the link to my blog - I must have missed it first time through as I was just so focused on enjoying your pictures of all your droolworthy creations and inspirations !!! LOL! O mercey...Such a beautiful studio. I love everything about it. 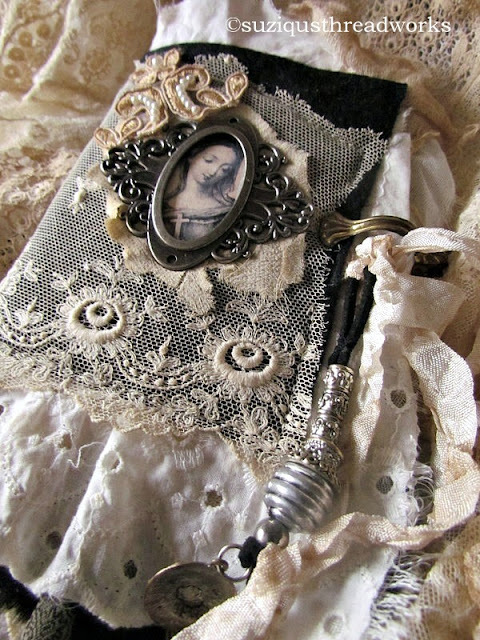 Totally LOVE LOVE your BEAUTIFUL journals. O how I could escape with my thoughts in those. And man what I would love to come play in your space. Thanks for sharing. Oh my Suzy!!! 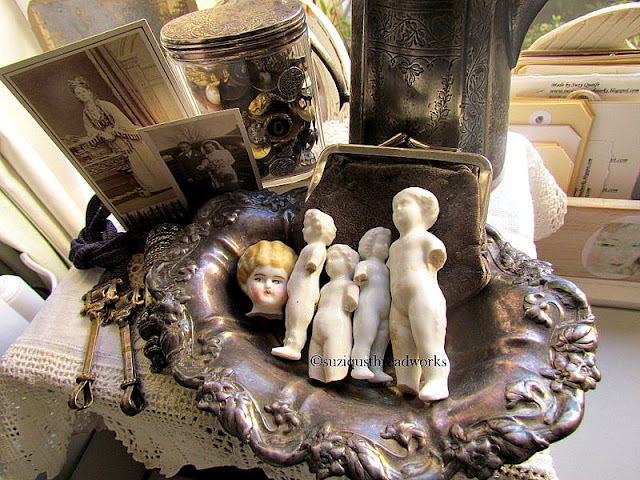 I just want to come and spend the day looking through everything in your beautiful and dreamy space! 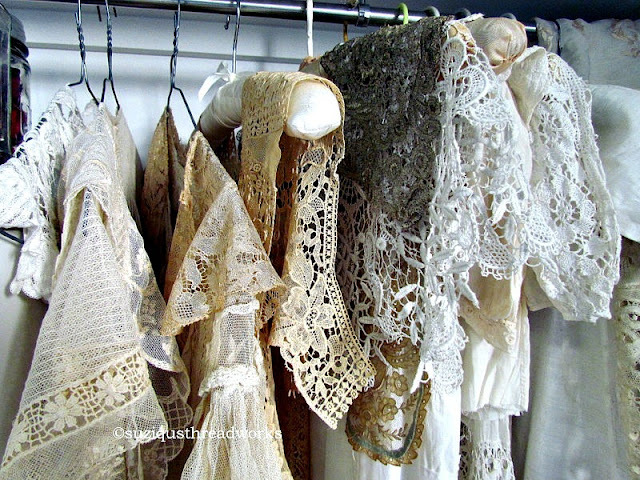 I would of course have to touch every lace and explore every bit and bauble! Your new space is lovely and the view is fantastic. I'm so glad you found the swans and your new best friends. Congratulations on a lovely post. 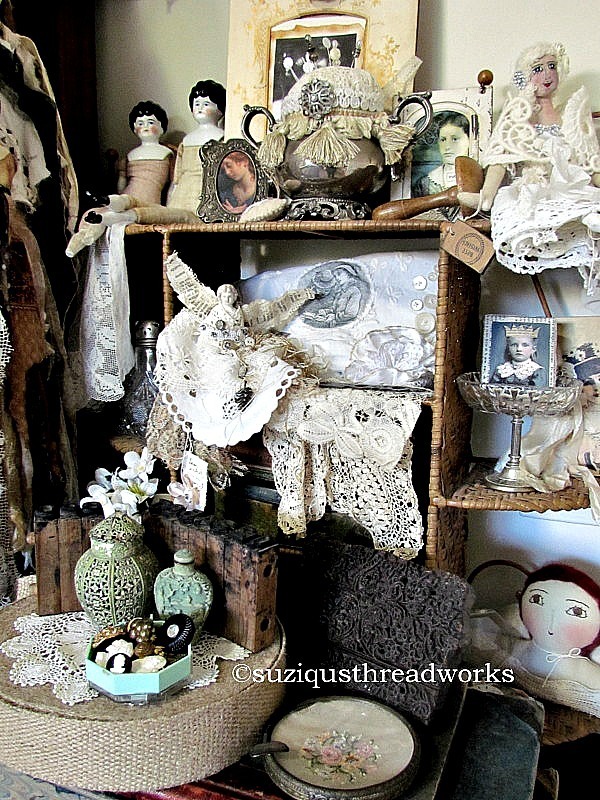 Hi Suzy, Love your beautiful creative space. Everything to use is right at your fingertips and so well organized. 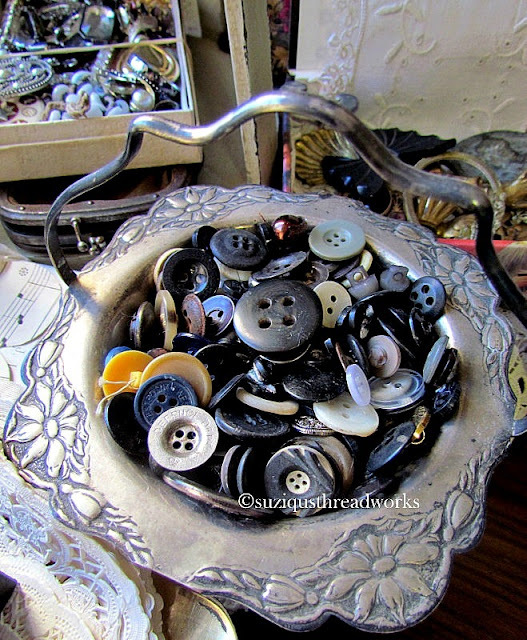 Your treasures are incredible and being surrounded by such inspiration has to be amazing each day. This is a special room to spend much time in designing. You pulled everything together in your new home so quickly. I know it was a lot of work but so rewarding for a space like this. Have fun creating and thank you for sharing and inspiring. This is a wonderful new space. 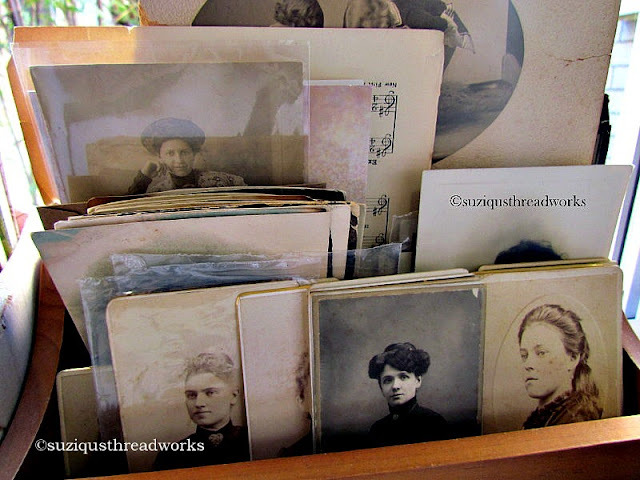 I went back to the picture that has those old Ledger books in a stack over and over. 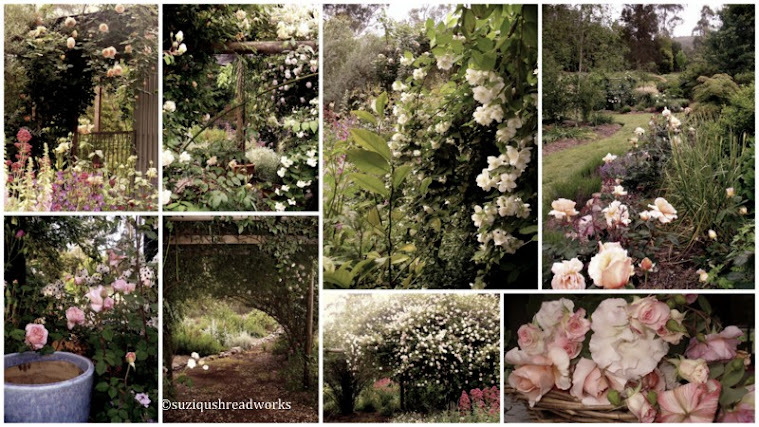 ---- I sure wish I would take the time to make my space as beautiful ---- simply lovely. It's wonderful to see your beautiful new space, dear Suzy. The lake view is just amazing and the view from your studio is very lovely as well. You must be inspired looking out of the windows. I love your open shelves. They give a good overview of your great stash. 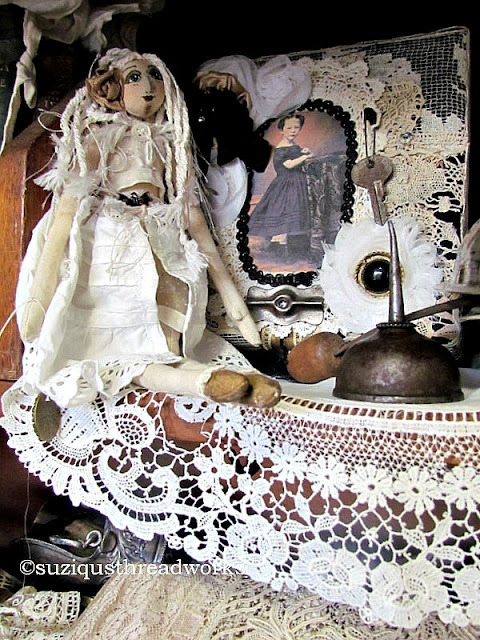 I enjoyed the wonderful studio tour and your gorgeous creations. Oh sweet Suzy... you are truly an inspiration. 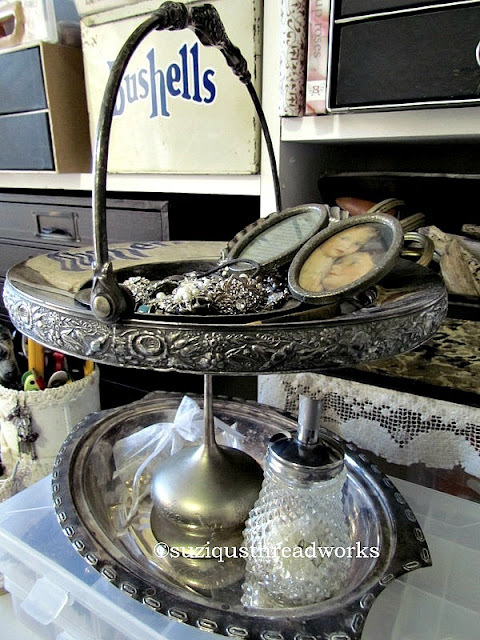 Downsizing is a painful process, but look at what you've created! I, personally, have a dozen rubber totes I'm trying to sort out. We actually downsized over 8 years ago, and I've been storing excesses in rubber totes! Selling on eBay helps. But it's hard to let go! And, I continue to surprise myself, when I open a tote and find amazing goodies I had totally forgotten about! So, you impress me! Sending you the sweetest blessings ever! 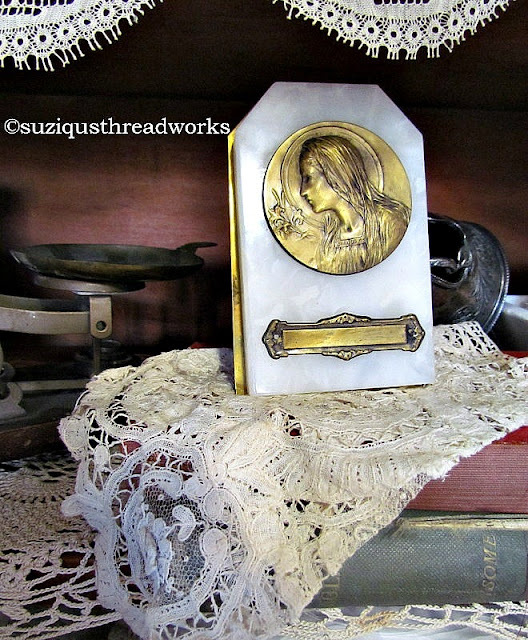 OH dearest Suzy, what a most beautiful new room ,you in this lovely new place. I love the cardboard ladies faces you dress with your fabric, I want to try one. I'll see if on is in your online shop for sale? 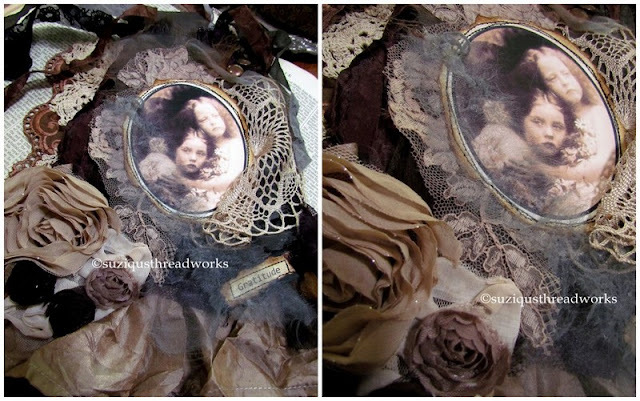 I still LOVE the hanging piece I won from you a couple years ago maybe more. It's still hanging on my newly painted blue buffet in my kitchen area with chatelaine I made out of old lace etc. 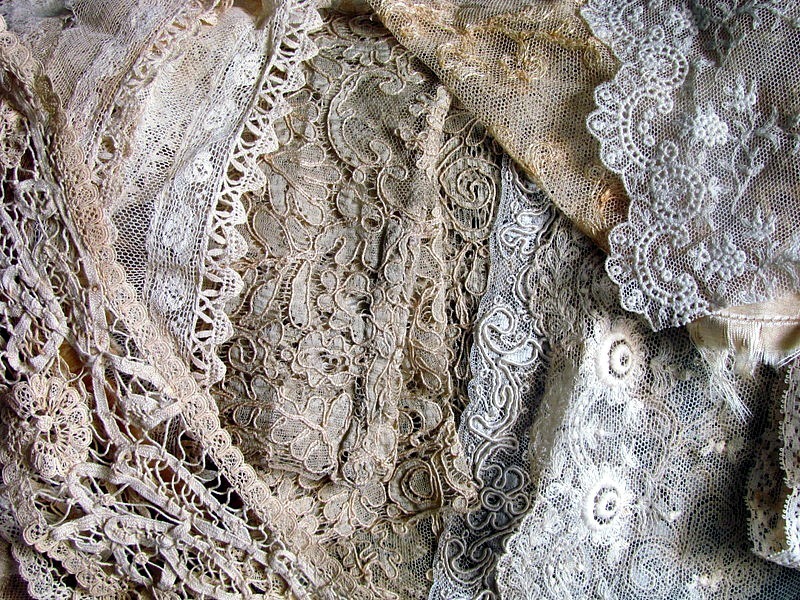 Such beautiful laces!!!! My mouth is drooling! Very nice work area with a beautiful view! Thanks for sharing! Hugs! Your space is so beautiful! 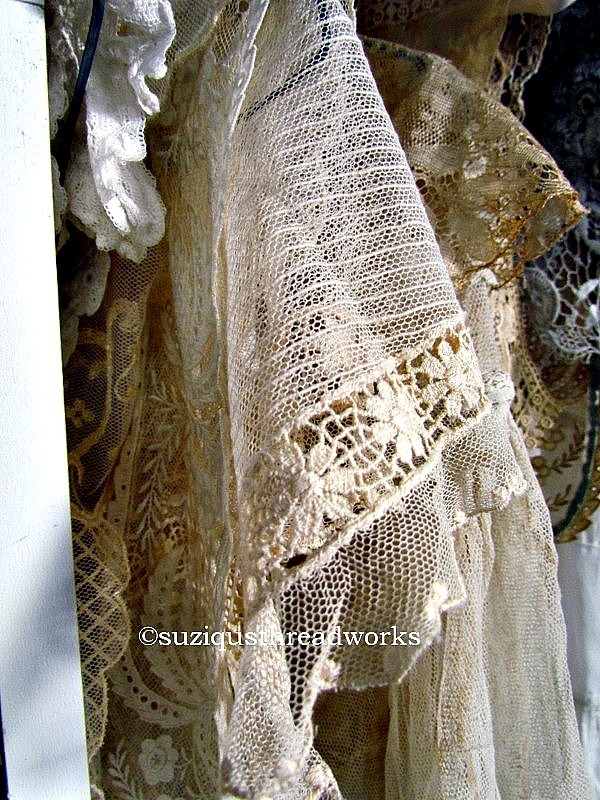 I too have a love for antique textiles, lace, embroidery. I use them in my creations also and totally understand the need to use them sparingly. And I tend to save every little piece to use for future projects. It's getting harder to find the truly old pieces! And the fact that you are an Aussie makes me smile. My mum was from Melbourne, she was a war bride and never became a "bloody Yank"! Both my parents were creative so I must get that from them. Thank you for sharing your beautiful part of the world to all of us! Everything is so beautiful. A studio sanctuary indeed. 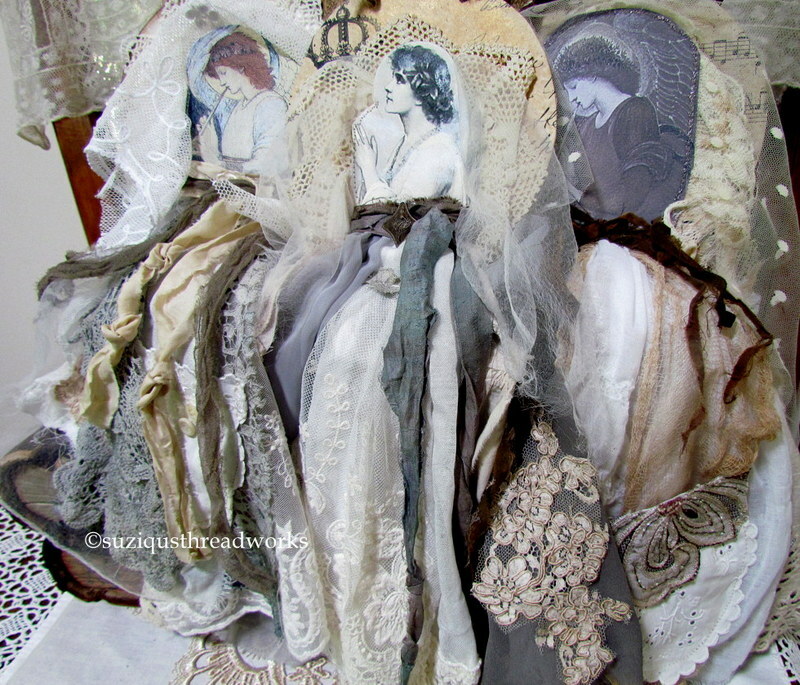 Your art creations are so lovely. 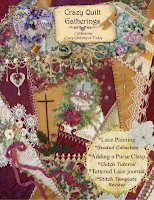 I love all the lace and old world art prints of women. This is my first time to your blog so it is all new to me. Your new home by the water is a peaceful place of daily inspiration. I will have to go back and see where you used to live. Your studio is a favorite of mine in this WBC party! 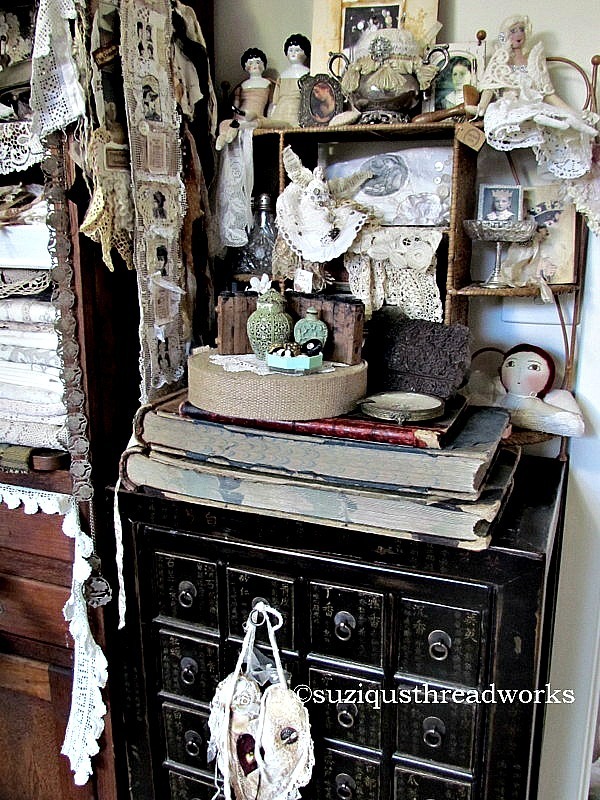 You have a fabulous creative space Suzy. I could spend hours in that room looking at everything over and over again. 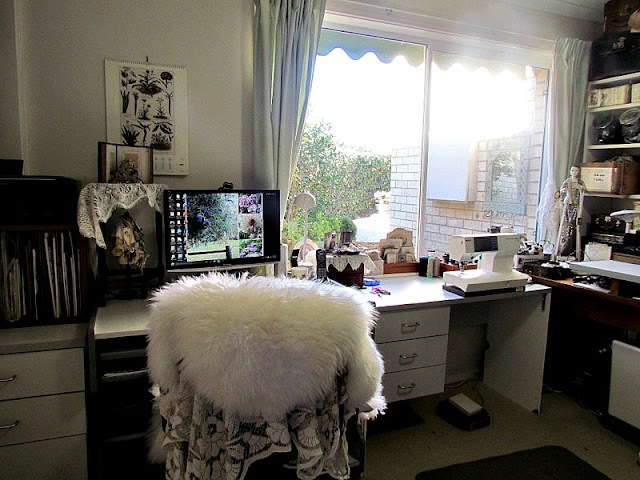 Your creative space is so glorious! 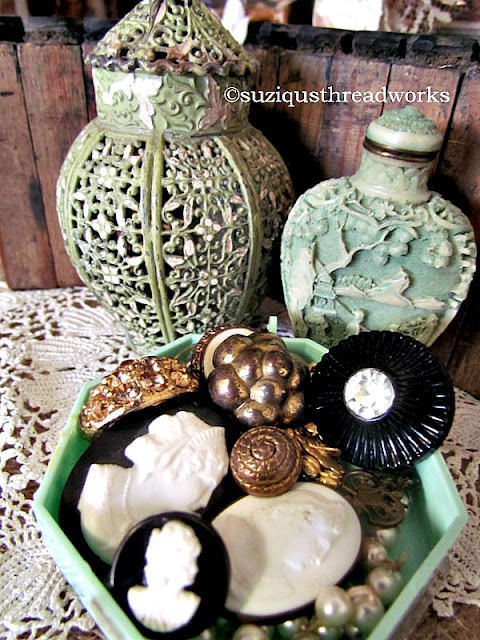 I could spend hours looking into the nooks and crannies discovering hidden beauties where you have stashes of unlimited vintage finds. Thank you for sharing your beautiful life! I am so amazed at your mixed media art and studio, Suzy. I haven't tried that art form (yet:)), but I find it so fascinating. I love the big window in your room...even here in sunny (and HOT) Arizona, the more light the better! Thanks for sharing your space. 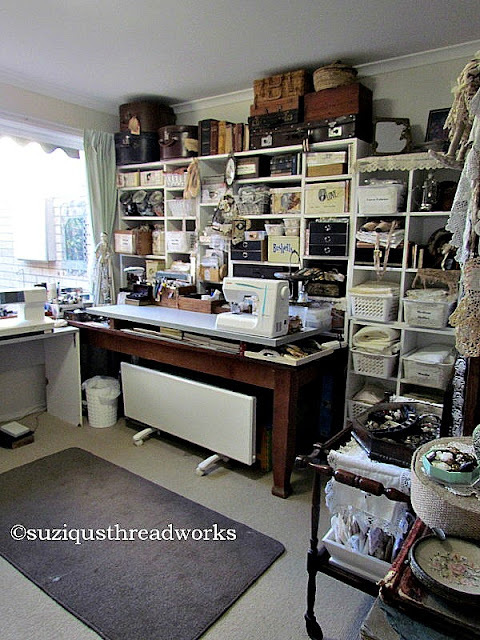 I'm just blown away, what an absolute fabulous studio Suzy! Love your beautiful creations they are always such an inspiration! 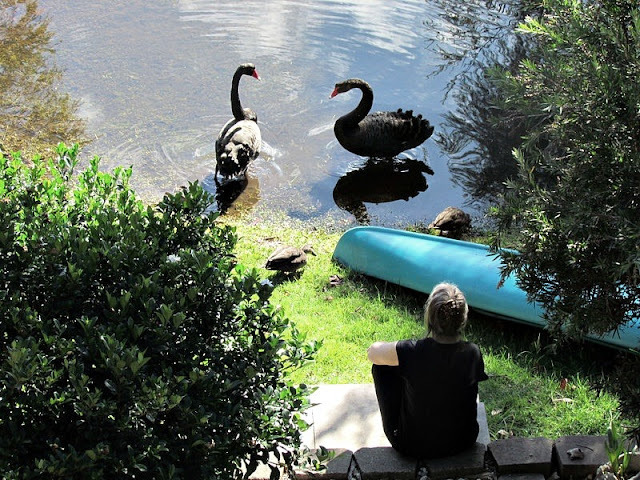 Hi Suzy, l popped in here through My Desert Cottage and l'm so glad to have found you since l rarely come across fellow Ozzies in blogland (I'm in Victoria)...Your new location is beautiful and how amazing to have swans visit your lake and garden...l wonder if you'll see cygnets in Spring. You've done an amazing job getting your studio so well organised in just a few weeks and what a lovely space it is. 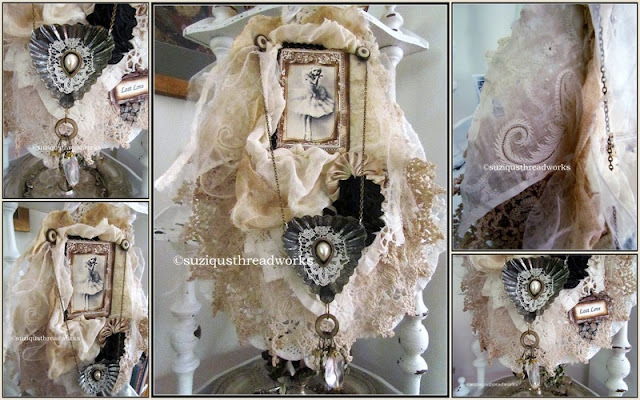 You have so many pretty things to work with and your creations are amazing, l especially love the black lace assembly behind the door. 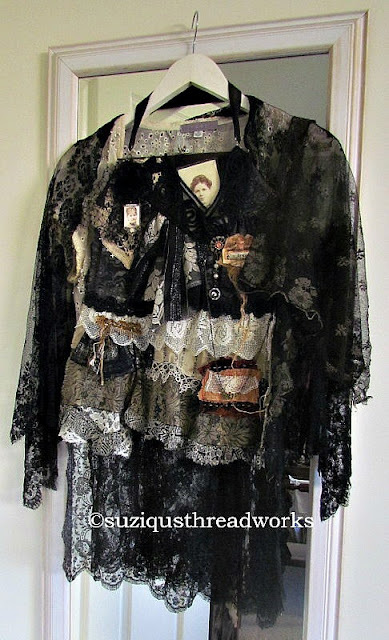 Also love all the cream lace clothing hanging on the rack and your gorgeous decorated Santos Cage Doll. 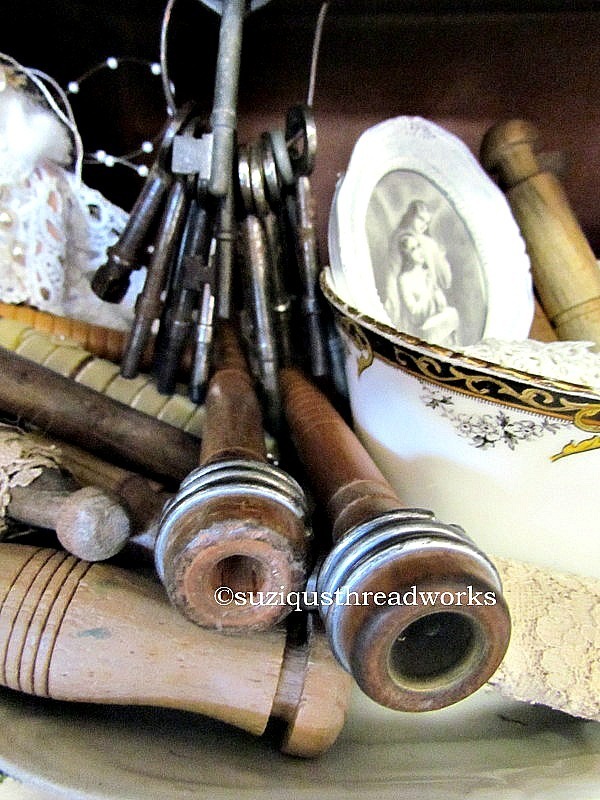 Suzi - thank goodness you posted! I almost missed the tour again! Am having a wonderful relaxing evening going through the pages now -- and adding my own to the list! Such a beautiful space! Wahoo, I'm very pleased to see the new place where you live and your wonderful studio! I'm happy for you, to have also this beautiful view on this lake with swans, it seems marvelous! Wow! A truly lovely space to create in. 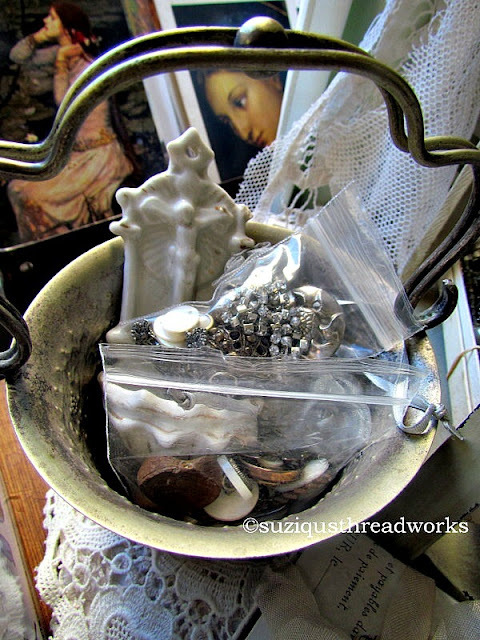 I enjoyed stopping by and seeing the lovely things you make and the wonderful ways you display your materials. Thanks for letting me be a fly on your wall. I am almost lost for words lol! Thank you for sharing your creative space, such a tidy, organised space too! 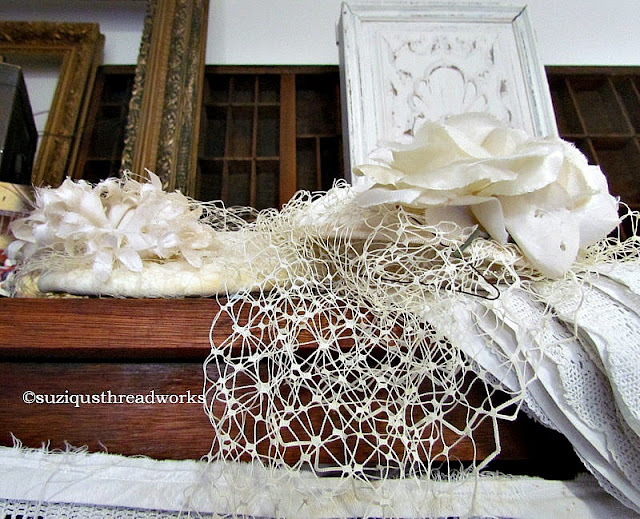 Thank you for sharing your beautiful work and studio! 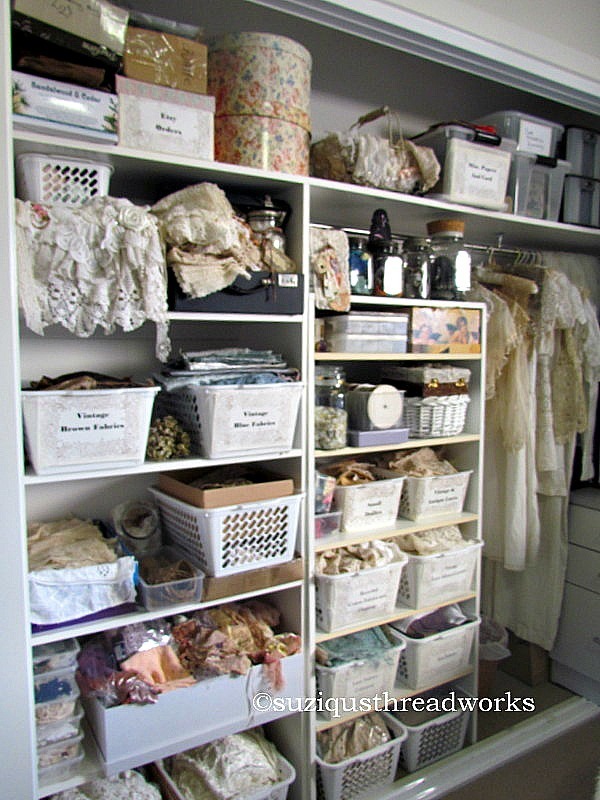 Everything looks so lovely and organized, and your collections are amazing! Such fun to virtually visit all these wonderful spaces. What a gorgeous place! Thank you for opening your door and letting us in. I would love to know more about your felting machine. 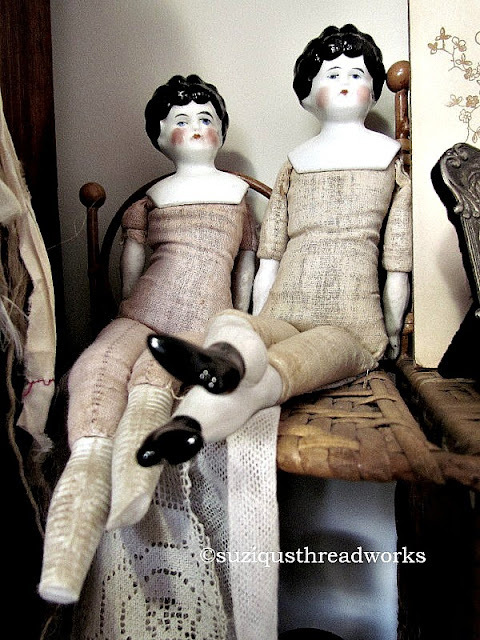 I needle felt and have looked at those machines but have yet to purchase one. You artwork is exquisite! Your new studio is BEAUTIFUL! Your creations are always breathtaking! You're amazing! I can't imagine how you have managed to move and get your creative space organized so quickly. I would still be peering into boxes and waffling over where to put what!! Thank you for the inspirational tour. Your space is lovely. What a delightful tour. Your work is so pretty. 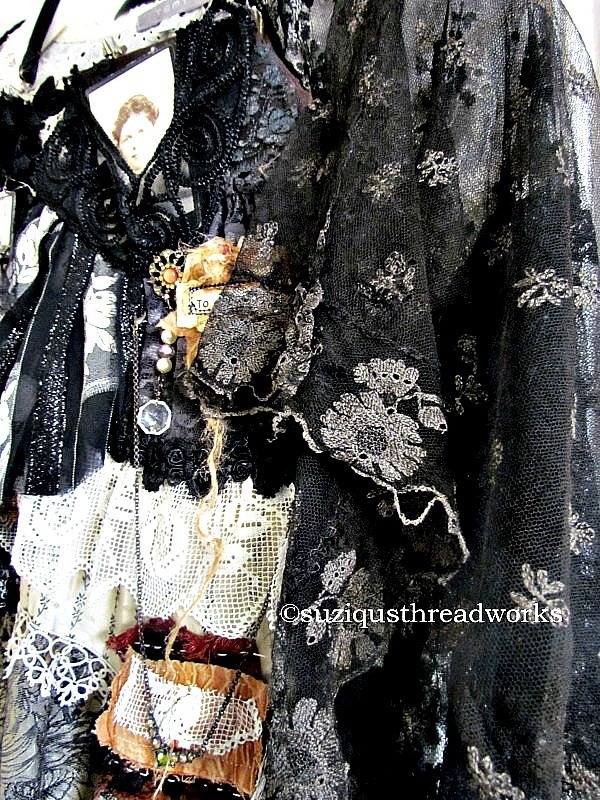 I've been wanting to do something with my small collection of lace and textile. You inspire. I'm following you now. 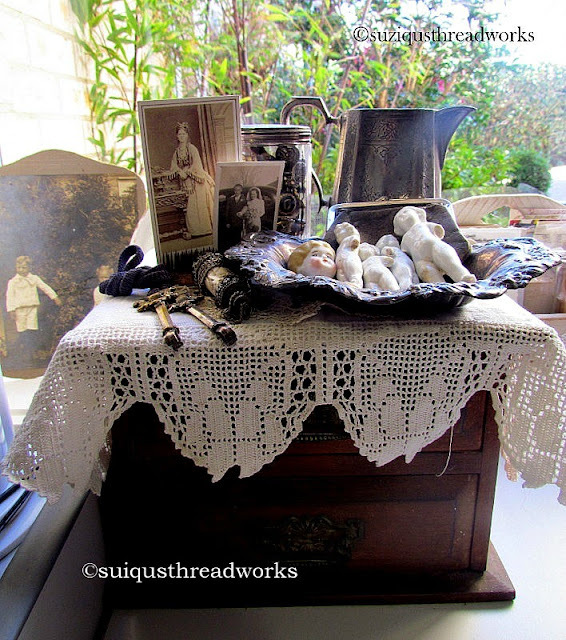 I hope you can come over and see my creative space! Thanks for joining the party and inviting us over. Have a good week. Your work-space, like your work is awe inspiring and lovely. You might have downsized, but it is so cleverly and beautifully arranged, and filled with so much light, that it makes me happy just looking at it. What a great space you have set up in a short time! Loved seeing all your wonderful "stuff." I need to go through and purge/rearrange my room, these posts should be my inspiration (since i've said that for 2 yrs now) I did finally sign up for your class-looking forward to it! Your work is absolutely stunning! Those journals are really beautiful. 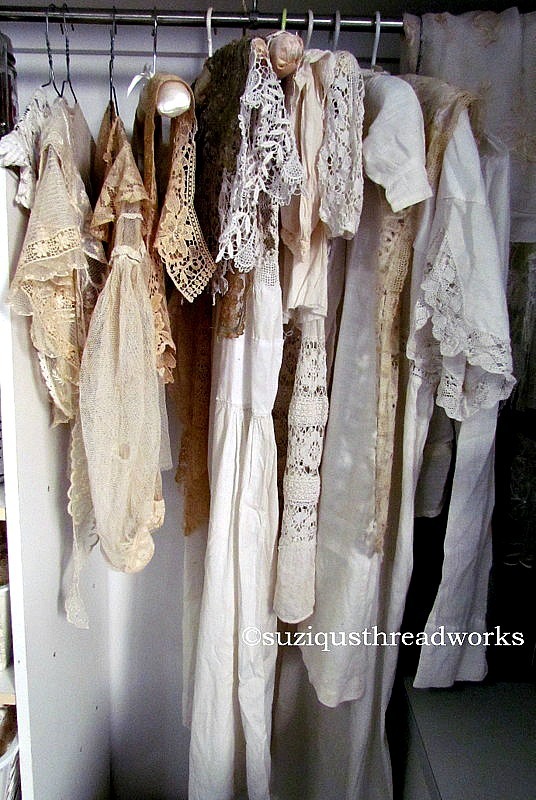 I loved seeing your lace filled space. 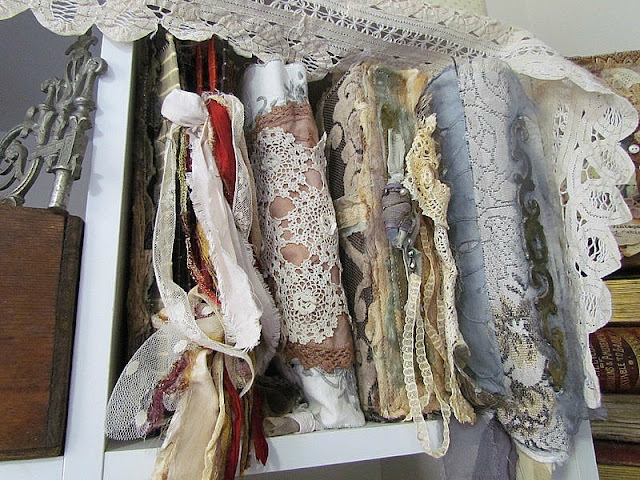 Oh, I believe I could spend hours in your studio admiring your beautiful laces, linens, fabrics and buttons! It is such an inspiring space as is your beautifully stunning works of art. I'm so glad I signed up for your workshop! I love your room and all of its endless treasures! Just beautiful! And the great big window is fabulous! 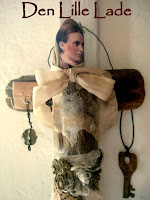 Hi there again, but wanted to pop back and say thank you for your visit to my blog and for your lovely words. l'm in Ballarat Suzi where we are really feeling the chill at the moment:-)would love to join the "where bloggers create" party but l'm afraid l'm not that techno savvy, but also my studio needs a bit more spramping l think:-) but thanks for the invite just the same. l am now following your lovely blog. Looks like the perfect workspace. And the view out your window....just lovely! I cannot believe how fast you work! Please come organize my studio! 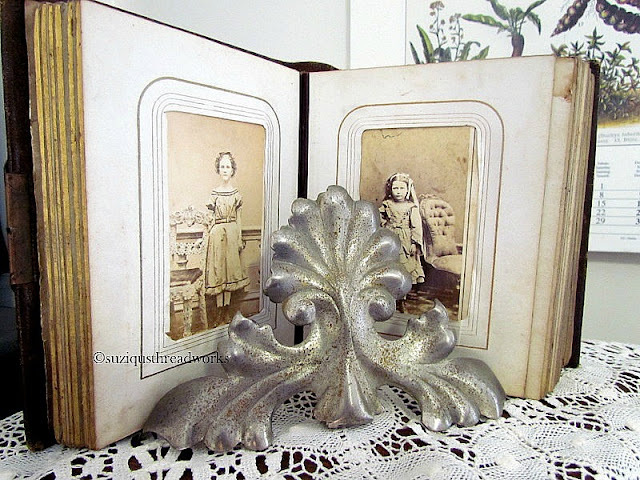 It was wonderful being about to zoom in on all the photos and see in detail your treasures. 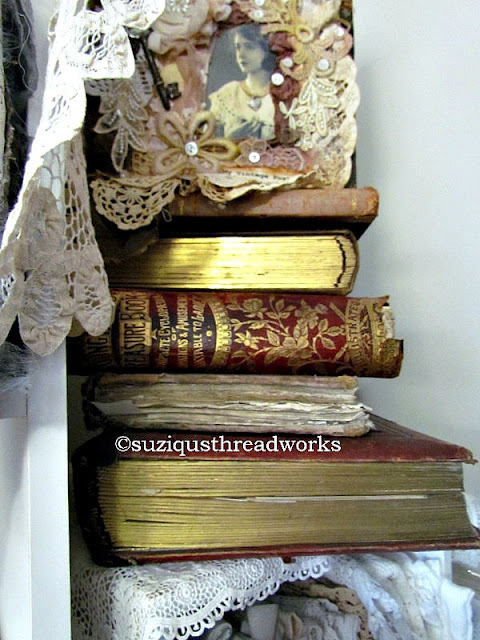 A few looked awfully familiar:) We need to talk about those massive pair to books under the doll area, they have marbled pages, would love to know whats inside them. You are such a treasure as artist and friend. We'll facetime soon! Your room looks totally gorgeous! 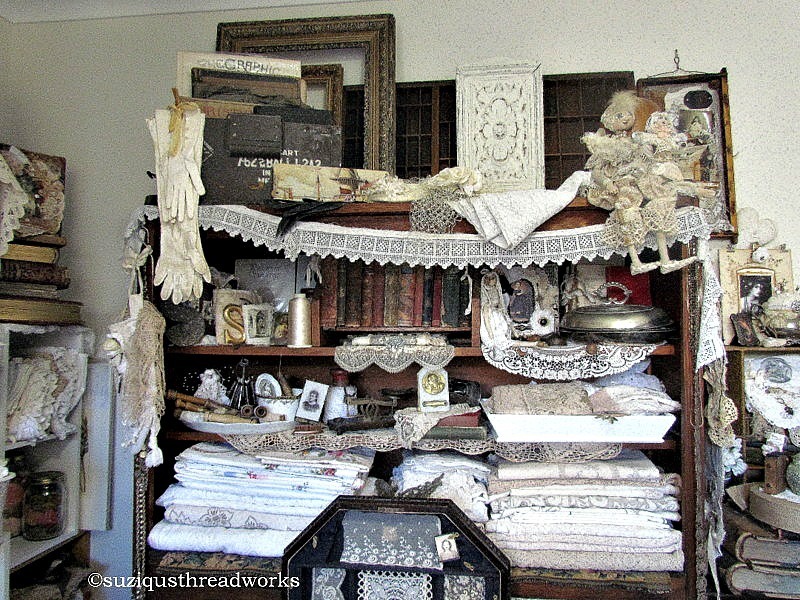 All those shelves and tables of beautiful vignettes, and boxes and stacks of ephemera and textiles! Wonderful artwork all over and gifts from loving friends really give the room such a dear feeling. I am so amazed at how well you have pulled your room together in such a short period of time! Each section looks lovingly arranged with such an artistic style! I didn't realize how extensive your collection is. 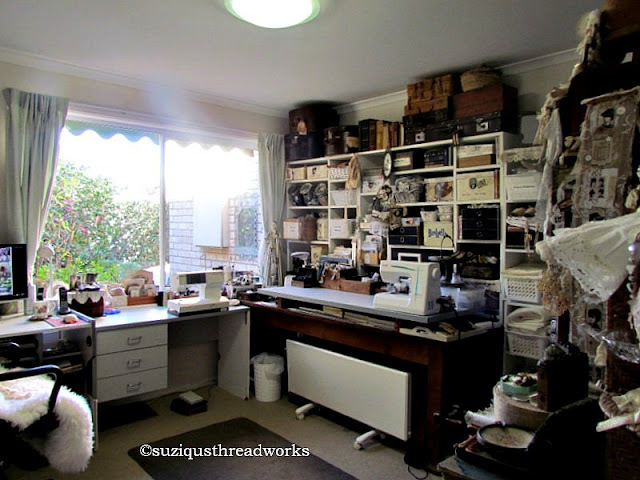 No wonder you love your creative space so! Incredible! I love that you have that large window right where you work too. The room looks quite bright in the pictures. The lake at the bottom of your garden is serene and must be such a pleasure to see each day, and with wildlife! Wow! 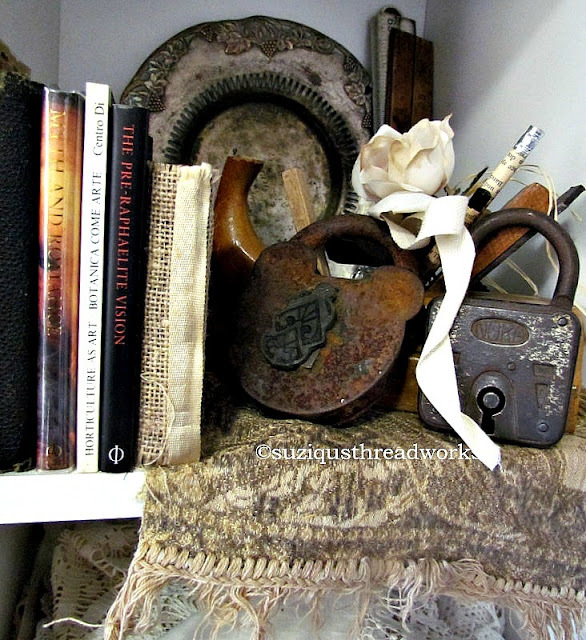 I am sure you will be having many wonderful creative moments in your new beautiful space! Wow Suzy you put all of that together in an amazing short amount of time, love it, such a beautiful job!! Your space is so beautiful! I enjoyed looking at your pictures very slowly. 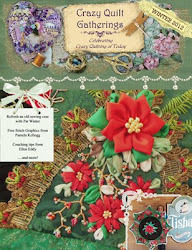 I always enjoy the blog party and feel inspired by all of the creative bloggers. Your space feels like a wonderful place to inspire creativity. 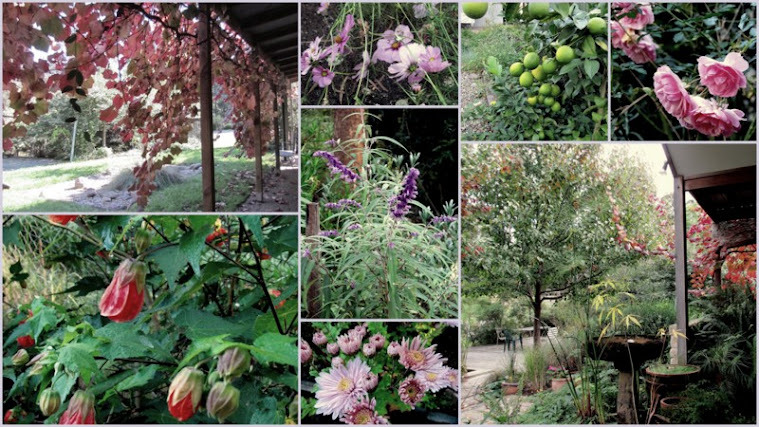 Your projects are beautiful too, thanks for sharing with us. Your new space looks very settled and pretty already Suzy. After a time you will come to love it, and all the extra time you will have to create in it. A big property takes masses of time to keep tidy and productive.Now you can have more time to sit and have a cup of tea, or a glass of bubbles on your verandas. You might need more Citronella for the "mossies".We will as it's been Very Wet here.Lovely though-not complaining. O MY!! Your creations are drop dead gorgoeus!! And your collection of lace is astounding!! I can not believe that you were able to get everything so organized in a few weeks!! Such a beautiful creative space!! Thanks for shairng!! Oh my goodness! 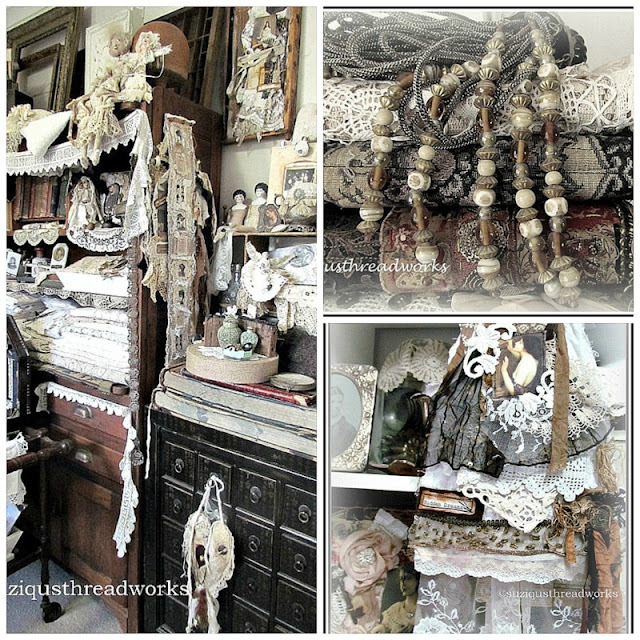 What an amazing workspace filled with wonderful treasures and inspiration! 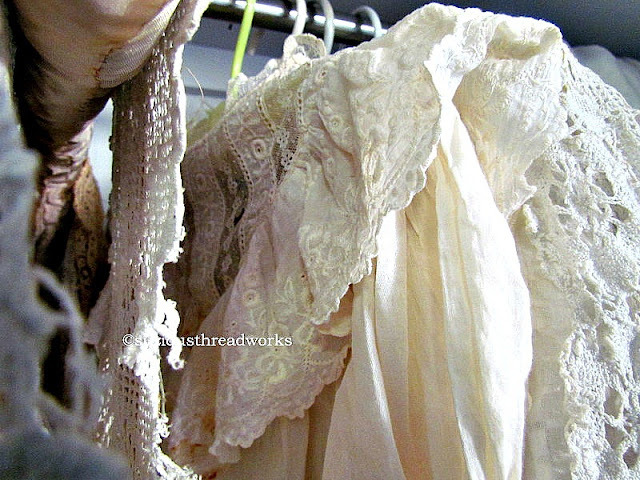 I could spend a week in there checking out your lace, and buttons etc!!! How on earth did you put this all together in such little time? Enjoy your creative space and keep on creating. Your work is so beautiful! Absolutely jaw droppingly gorgeous. It is a room filled with passion and love for the beautiful things in life. 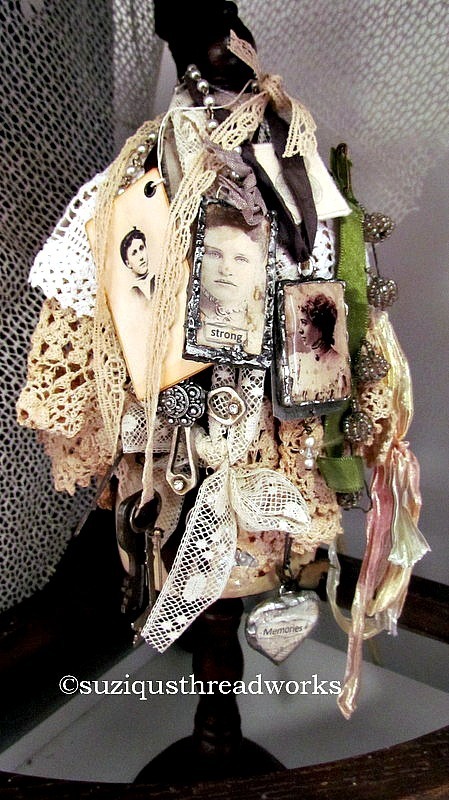 Your art is beautiful and I love the choice of words in the assemblages shown. Thanks for sharing! It must be a real delight to create the beautiful things you do in such a fine work space. I really am at a loss for words.